It doesn’t get much better than the Bhang Stick. There, we said it. The same company that brought you the triple-strength Bhang Bar now brings you a personal vaporizer and cartridge options for maximum flavor and convenience. And thanks to the mainstream popularity of portable vaporizers among the non-medicinal-marijuana set, you no longer need to hide away to get the medication you need, when you need it. Bhang’s premium personal vaporizer, the Bhang Stick, comes completely self-contained, including a cartridge and an inhaler that doesn’t require pre-loading like many vape pens & cartridges on the market. It’s powered by a 280mah battery and has an attached atomizer (upgraded to include a Nichrome coil) that delivers mouth-watering concentrates with an effortless drag, and visible vapor. Its clear, see-through barrel allows you to easily track how much remaining oil you have at any given time, so you won’t run out unexpectedly! Lasting approximately 100 hits, Bhang Stick is a must for those who need accessibility and reliability without a fuss. The kit, which comes in a sleek carrying case sporting the Bhang logo, contains a USB charger and cartridge, perfect for use just about anywhere, at anytime. The real jewel in the Bhang personal vaporizer line is the replacement cartridges, which are really products unto themselves. Created with standardized 510 treading, these cartridges fit almost any regular e-cigarette or vape pen; no additional adapter pin required! You don’t need to purchase an entirely new system to take advantage of their products. Bhang offers a whopping 60 assorted sativa, indica, and hybrid strains to choose from. Alongside favored old-friends like Sour Diesel, Bubba, and OG Kush you’ll find exciting new strains such as Alien OG and Super Lemon Haze. Choices like these mean you won’t get bored with their 100% cannabis oil cartridges anytime soon! Bhang utilizes C02 extraction methods to extract THC essential oils, and that means no chemical residues are left behind, as compared to butane, a popular extraction solvent, which can leave potentially deadly heavy metals in the finished consumer product. Bhang combines natural cannabis oil with coconut oil and nothing else. No glycols. No additives or glycerine. Just pure, unadulterated, liquid-THC. To ensure consistent cannabis dosing, each product comes complete with potency details on the back. There are three levels of cartridges available allowing you to select the dose best suited to your situation or preference, reducing the potential for consuming products either too high or too low in THC for your needs. Low: If you’re looking for something in the 25-35% THC range, then you’ll want to pick up one of Bhang’s Natural Oil cartridges. 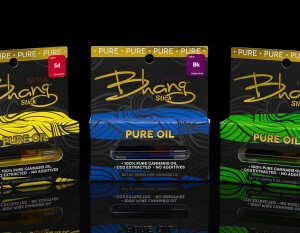 Medium: For 50-65% THC choose Bhang’s Pure Oil cartridge. High: For maximum THC dosage, of at least 70%, be sure to check out Bhang’s Black Private Reserve. Small (275 mg): Black Private Reserve oil is the only one available in this size. Large (1,100 mg): Both the Bhang Stick All Natural and Pure Oil are available in the large cartridges. And all cartridges come with a sleek, flat-tip mouthpiece, reminding me a little of the cigarette holders from Hollywood’s hey-day, adding an extra element of comfort and class. Set your vaporizer wattage to low. A 7-wattage is typically the preferred heat, though many recommend a 3.5-wattage to start with (lower wattage prevents burn out). You don’t want to accidentally use up all your oil before you get to try it! Remove the cartridge from the plastic tube (you may want to hang onto that tube as it’s a perfectly-sized joint protector, and it’s good to recycle!) Attach the cartridge to your vaporizer and you’re ready to go. No primer puff required. Because of its smoothness and dose reliability, it’s ideal for those with lower THC tolerances or first-time users. So whether you’re at home or on the road, Bhang Stick lets you take your medication with you, helping you get out there. And isn’t that what it’s all about? “I tried the sativa-heavy Lamb’s Bread and the indica-heavy Ogre. Lamb’s Bread is full-bodied, light smoke with a super bright taste. Totally uplifting. A totally enjoyable cerebral high. Ogre was much heavier, a totally deeper, more relaxing high.” —Jazzmin M.
“Simply, it’s one of the best on the market today, so much better than the other ones I’ve tried. They aren’t even worth mentioning.” —Doug R.
“I’d rate Bhang the top of any C02 oil I’ve tried, and I’ve tried a lot. It gives the cleanest taste, best flavors and it’s just about the easiest way to dose that I’ve found. I can use it anywhere. No one cares. No one notices. Bhang Stick is absolutely out of this world. It’s discreet, you know. People don’t know what I’m doing and that’s why I won’t use anything else. I mean, I freaking love these things. Wherever they’re getting the buds from, they’re growing them right!” —Nancy L.
We love sharing awesome content on our blog to help cannabis patients better understand the plant they love, but we’re also pioneering the way for easy, quick, and professional cannabis delivery. My Bhang Stick isn’t giving me vape. My cartridge looks like it has crystals or dried out somehow. Is there anyway to fix this? Battery works fine. I recently got the Bhang cartridge. I am very familiar with coils, capes, mods, etc. This SOB is defective. Right out of the box it did not hit. I tried a different brand and it hits great. I’ve pulled the bottom out a little to ensure contact between coil and element. I get no hit at all and it’s a damn shame because the dry hits are tasty but I didn’t buy it to dry hit for the rest of my life. I tried sucking out the oil with a syringe and it’s to thick to pull through and to much air to make a proper suction lock. I’m super disappointed because I brought it with me still sealed in its sleek black box to NY for medicinal needs in an unfriendly state. Even if I could bring it back the place it was purchased has no refunds posted throughout the facility. I got burned. Spend more time and attention on making sure the disposable cartridges work and less on the packaging and marketing. Thanks for nothing. These Bhang sticks are absolute garbage. Sure nice quality if you can get the Thing to vaper. All I see is people complaining about the same thing. First time, great, then no. Stick clogs way too easy, then you have to screw around to get one hit again. Pfth. Crap. It’s 20 for a charger 65 for cartridge. Wow. Great, thanks! Garbage. Stick with a dab rig. The vape pen game is just crap. Never work as advertised. No Bhang for the buck.